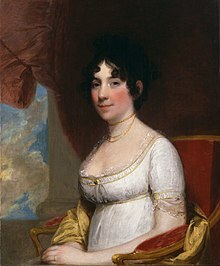 Ba í Dolley Payne Todd Madison (20 Bealtaine, 1768 - 12 Iúil, 1849) Bean Uachtarán na Stát Aontaithe ó 1809 go dtí 1817 nuair a bhí James Madison ina Uachtarán. Rugadh í in New Garden (a dtugtar Guilford County, North Carolina anois air). Nuair a raibh sí 21 d'aois phós sí John Todd, Jr. Fuair John Todd post dá máthair. Bhí sí ina bainisteoir de teach bordála. Bhí beirt phaistí acu, John Payne agus William Temple. Fuair William agus a fear céile bás sa bhliain 1793 ó fiabhras buí. Phós sí James Madison sa bhliain 1794. Ní raibh clann acu. Bhí sí ina cónaí in Cutts-Madison House, Madison Place in Washington, D.C. tar éis bhás an dara fear céile 1836. Tugadh an leathanach seo cothrom le dáta an 29 Eanáir 2019 ag 07:56.